tag:aiblins.com,2013:/posts Aiblins 2018-11-03T14:09:42Z MrUlsterscot tag:aiblins.com,2013:Post/1180862 2018-11-04T12:00:00Z 2018-11-03T14:09:42Z You Ya With this Year? 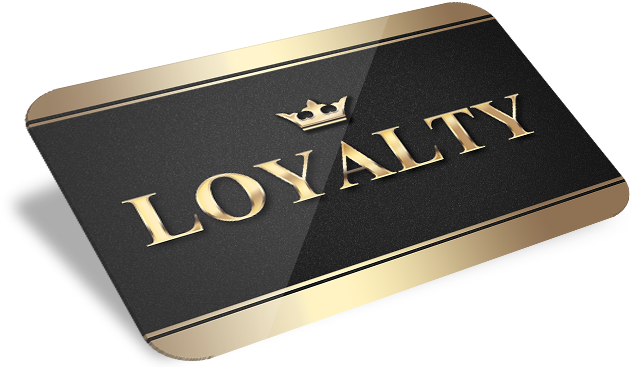 Loyalty seems to count for very little these days. When I was at Primary School, we all picked our football teams. Of course it tended to be the teams in the current ascendancy which were favoured, but whichever one you plumped for, that was your team. For life. As the fortunes of the team would wax and wane, moods would rise and fall. You took the rough with the smooth. By the time I had hit secondary level education my own team was still up there, but I can remember the head scratching at the classmate who supported Chelsea. His time eventually came - he just had to wait a a little longer. The point was that you picked your team and you stuck with them - through thick and thin. Back then, it tended to be the same thing for players - not that there weren't transfers, but the wages were more modest and it was not uncommon to see a player serve out the bulk of their top flight career with one team, before drifting off towards the lower leagues in their twilight playing years. The wealthy mercenary millionaires of top flight football follow the money from team to team and country to country. In an attempt to curry favour with the fans following a move, they issue cynical press releases claiming boyhood affection for [insert name of new playmasters here]. I would say they were fooling no-one - but apparently they fool a brave few. It doesn't seem all that long ago that when you were approached by someone who had learned you played either drums or pipes, their first question would be "What Band are you in?" Now the question is somewhat different - "Who are you playing with now? ", or "Where are you this year?" There seems to be a positive expectation that relationships with a band are now fleeting things. Like the Premiership footballers, we hop from squad to squad, seeking the glory of prizes and promotions, but jumping ship immediately that a better offer comes in. No longer do we buckle down when things get tough - now we simply up sticks and head for the hills. I have no desire to rhyme off the list of bands which have gone through this process but we can probably all name them. It has become particularly prevalent in the lower grades, where the glory hunters ply their destructive trade. They identify a Band with some potential, join up (perhaps telling their mates they are only "guesting" until the results start to come in) and stay out a season or two, collecting titles and trophies on the way. Then the inevitable happens. A tough year. Maybe another contender Band has emerged. Maybe a promotion has been secured which proves more challenging for the players. Whatever the reason, the trophies are harder to find and the "Another cheeky first place" posts on Facebook aren't appearing. In years gone by. this would be the time to regroup and build for the future. Not now. Now, this is the time to start ringing all your contacts and asking them where they might be playing next year. Abandon ship! Abandon ship! Of course as you sidle out the door, you might mutter from the sides of your mouth that "if you can get something going again, give me a shout" but those weasel words don't mean any more to the audience than they do to you as you utter them. Surely the honourable thing to do is to stay and rebuild. Why is it left to the loyal few to take on that task as the glory hunters move on their next victims? Having pondered on this for a while I think there are two motivating factors which have brought us to this point. Firstly, this is the era of instant gratification. We simply won't wait for anything - and certainly not success. We want it now. We deserve it. And if this band won't do it for me, then maybe that crew over there will. Building, teaching, planning. They all take time and we won't wait. Secondly, the big Bands are showing the wee Bands that this is the way to do it. Several (if not most) of the Grade One outfits have "members" from other countries to their home base. Notably, Field Marshal Montgomery has essentially two bands - one in Northern Ireland and the other in Scotland. There simply cannot be the "team spirit" in a Band where players only meet a handful of times in the year. And yet their success speaks for itself. The system works. Be ruthless in your approach and reap the rewards. It clearly works, but don't kid yourself that these are Bands in the older sense of the word. They are winning machines - but machines with no souls. They meet, they play, they win, they post about it on Facebook, and they go their separate ways. I wonder could they all even name eachother? Fair enough, if that's what you want. I don't. The Bands used to be about more than that. They bred a sense of community. You had your Band. It would have its ups and downs, but it was your Band. You knew your fellow members - for years. People grew up in the Band. Generations followed eachother through the ranks. It built spirit and found common cause with its community. The Bands were forces for good, getting kids an interest and fostering inter-generational transfer of skills and tall-tales. Whatever these things are that we have now, they do little of that. And they are the poorer for it. Like the title says, it's been a while since I last posted on here and I have a raft of excuses why that is. Work has been hectic and difficult, age has been creeping up and the general pace of the life I lead seems to be increasing on a weekly basis. Often-times over the course of the last year or so I have found myself wanting to do nothing quite so much as curl up in a ball. The usual fodder on here in recent years has been Pipe Band related - and in common with many other exponents of the genre, my Band has fallen on troubled times. Indeed, I had posted an article addressing what I think is at the root of the problem for many bands about a year ago and then took it down, for fear that its tone was too reactionary. Looking back, I don't believe that it was and I'll repost that again shortly. I made the traditional trip to Glasgow over the period of the World Pipe Band Championships and acquired the usual copious amounts of video footage. As some of the you may have seen, I also undertook a slightly different video project in making daily(ish) Vlog style records of the days from Tuesday through to Saturday of "Worlds Week". In truth, I also have footage from Sunday but as it lacks any real pipe band content I haven't uploaded that yet. I was broadly pleased with the reception to the Vlogs - although it was interesting to note that engagement tailed off as the week went on. I partially attribute that to the fact that by the end of the week most of those who would be most interested were either in Glasgow themselves or were thoroughly in a state of pipe band exhaustion following live streaming Grade One. In my own opinion, I think that the Vlogs actually serve as a better record of the Piping Live events and the Worlds than many of my other recordings on the basis that they take in a little more of the colour of the City and of the event rather than the robotic recording of practices and performances. On that basis - and because I sort of enjoy the creative process - I hope to continue this pattern in subsequent years. I still have huge amounts of footage of the bands to upload and hope to get started on that shortly. What was missing (due to concentration on the video) this year was the posting on here of commentary/predictions/results. I think that posting results in the age of Twitter and Facebook Live now seems redundant but I suppose there remains some place for comment. I had really hoped to have time to do an analysis before the Worlds of the Results earlier in the year to see if they could be used to predict who would lift the World Title but life got in the way. I may still give it a go, but time will be the deciding factor once again. Okay, it perhaps falls slightly sort of a scandal, but it's a fact nonetheless - and you can see the proof in the photos. IDPB was in sparkling form at Victoria Park in Glasgow this afternoon ahead of tomorrow's qualifiers. 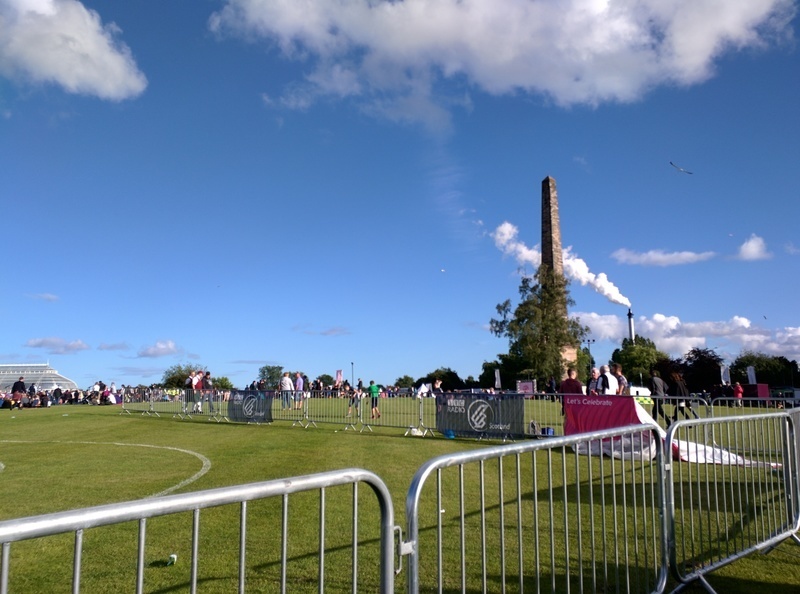 Action starts at Glasgow Green around 11am with gates opening a few hours earlier. 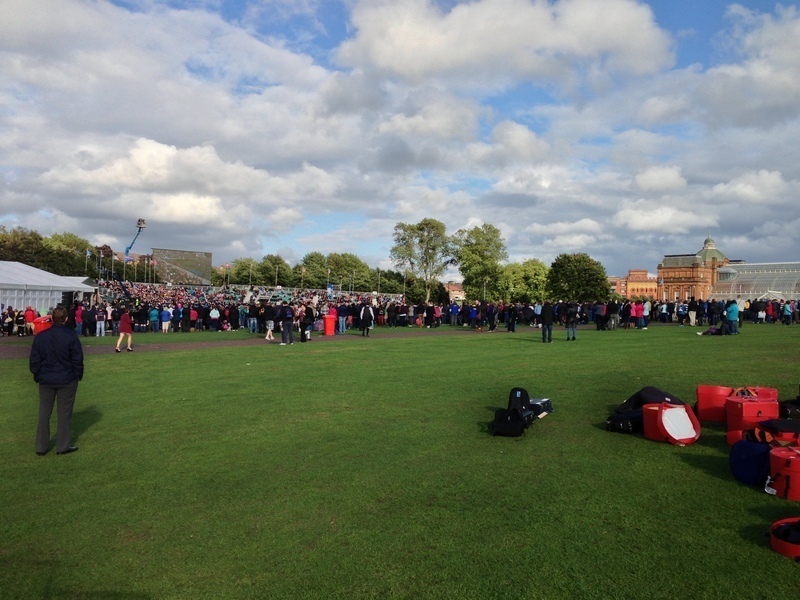 Field Marshal Montgomery drum corps was on the grass at Kelvingrove this afternoon. The big news was the white Andante Core-Tec heads in their Premier drums. These new heads are popping up all over the place and sometimes it can be hard to say exactly how much of a difference they make. It may all be psychological for the players - but they were certainly sounding well. The whole Band was present and playing through both medleys. The Hard Drive set in particular has the hairs standing up on the back of the neck! ]]> Admin tag:aiblins.com,2013:Post/1178867 2017-08-02T21:00:05Z 2018-02-22T11:27:06Z Inveraray for the Win? The Scottish Championships behind us, there's only the Worlds to go - and the pundits are circling. Around this time of year, I always try to look back at what I wrote at an equivalent point in the year previous. However, last year I wasn't able to post at this point and my reflections after the event simply referred back to the year before! In fact, the situation at the moment probably differs only slightly from where it has been for the last few years. Field Marshal Montgomery is still the Band to beat at the piping end. That is despite receiving a relatively lowly 4,2 from the judges at the weekend just past. What has changed is that the judges seem prepared to go past them - and even to drop them as low as 4th! They certainly can't be guaranteed 1,1 or even 1,2 as would have been the case only a few years ago. More than that, it seems that when the ones and twos leave the Northern Ireland band, they seem to be destined for IDPB. Combined with the fact that Inveraray's drummers would be (almost unanimously) recognised as a better corps that FM and there appears to be an inevitability about the results come August 12th. I'm not sure if the judging panel has been released for the Worlds as yet - and I'm almost scared to look. There is no doubt that personal preferences on the part of judges play a large part in the destination of the trophies. I would point out that this is expressly not a suggestion of improper bias. Rather it is the simple observation that judging is a subjective activity. Get two judges to stand in exactly the same spot on the same day and it is perhaps more surprising when they agree completely than when they have at least a little difference between them. This is perhaps even more the case in Grade One, where the judge will likely not have any cause to note a mistake or poor blowing. Phrasing and style are more to the fore - and those are clearly subjective matters. Of course the conspiracy theorists would point to family ties and cry foul.They could be right, but these are accusations easily made and hard to substantiate. In fact, peculiarities in the judging are more noticeable in where judges place their less favoured bands, rather than where they land the number one. At this stage, it looks like the Grade One title is destined either for FM or Inveraray. Across the season thus far they have been the only winners. Yet in the Scottish we have a 4 for FM in piping and a 3 for IDPB in drumming (with FM snagging a handy 2). Those would be unexpected figures on all fronts, but let's give the judges the benefit of the doubt - they were standing in the circle and I certainly wasn't. Overall, let's not get too excited. Even at Dumbarton, the gap between first and second was only 2 points. FMMPB won the ensemble. They are still there or thereabouts. I stand by my earlier thoughts. 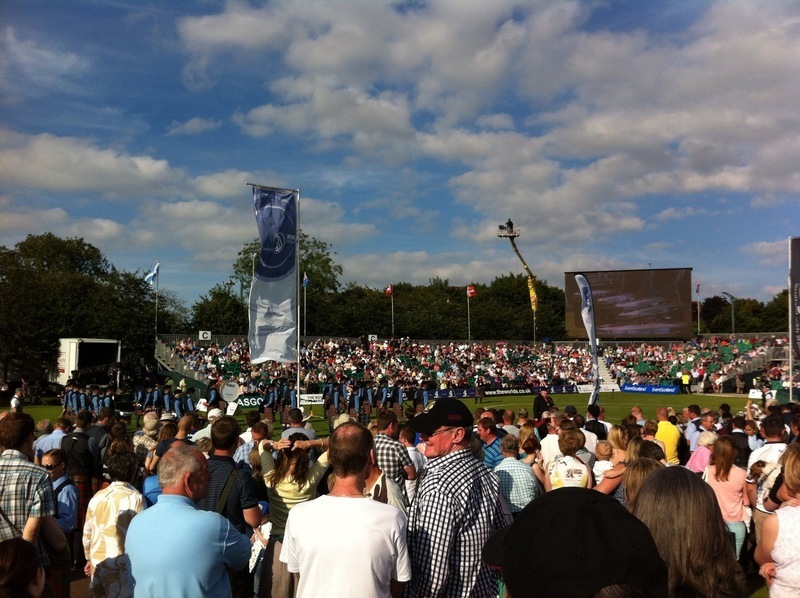 With the results at the Scottish, the stars seem to be aligning for Inveraray to lift the top prize at Glasgow Green. There is perhaps a little more doubt as to the destiny of the Drummer's Sash - although a couple of years ago most people would have thought IDPB would lift that prize before annexing the Overall title. My guess for it is that it will be between SLOT and IDPB - perhaps with a split across the Medley and MSR. So, here we are. 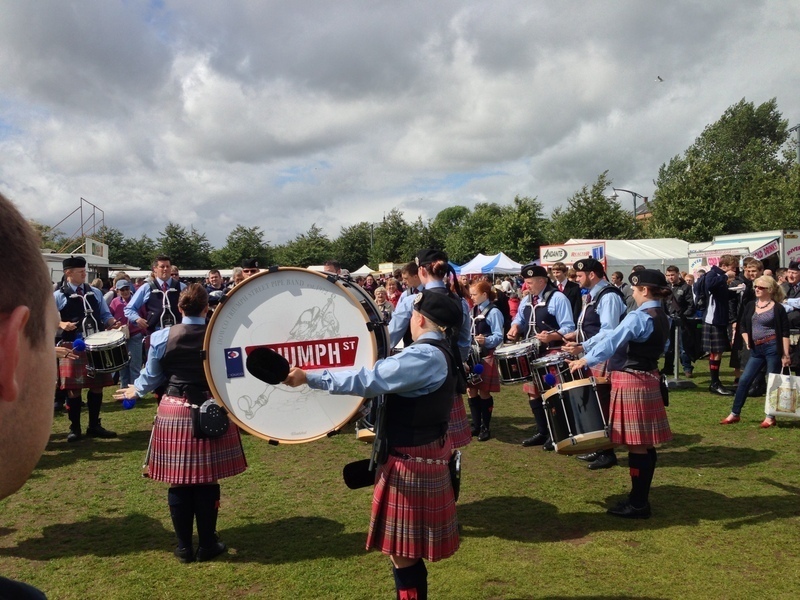 Around the half way point in the pipe band season and what do we know? Inveraray & District sit precariously at the top of the pile, with Field Marshal nipping at their heels. Two wins to the good, but with their durmmers perhaps not showing the dominance that one might have expected. 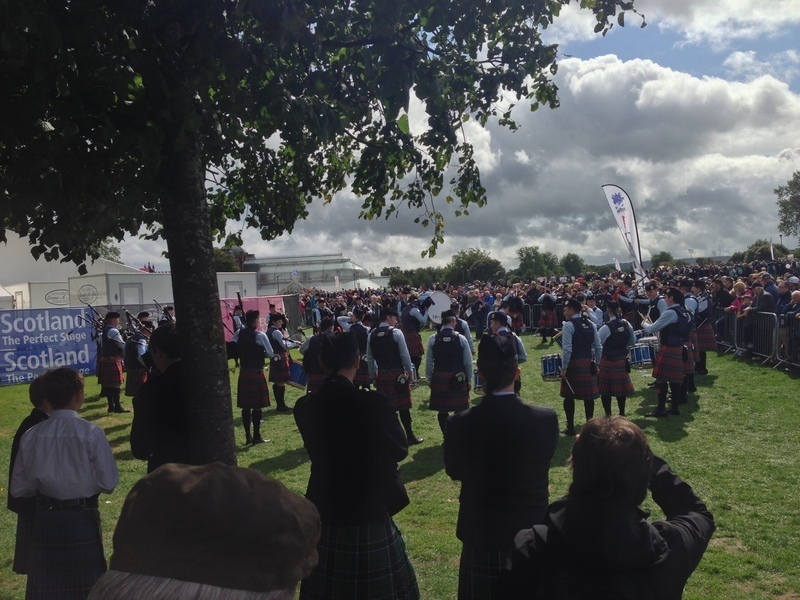 In the opening Major of the year, Inveraray managed to annex the overall and a second spot in drumming (with a 1 & 2 in piping and a 2 in ensemble to boot). However, FM finished only one point behind and their much maligned drum corps sneaked a third place and they placed first in ensemble. 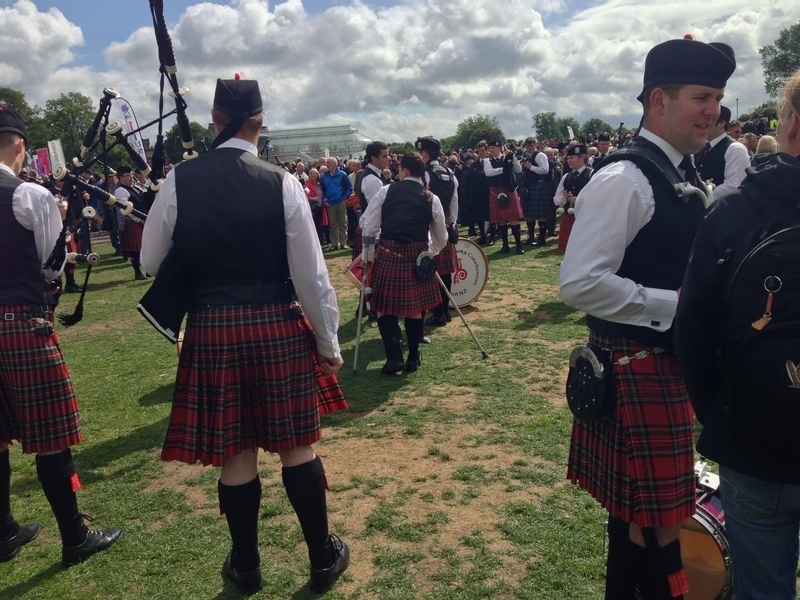 By the time the United Kingdom Championships came round, Field Marshal appeared to have consolidated again and they completed the clean sweep of piping (1,2), ensemble and drumming. The gap this time was three points back to Inveraray and it could have been considered a signal that we were going to have another season of "business as usual" for the Ulster band. Then came the Europeans. The order had reversed again, with the Scots coming out on top again. This time we saw an even split in piping, FM won the ensemble, with IDPB in second but crucially the Field Marshal drummers placed only fifth, with Inveraray lifting the first prize. So, what does that all tell us? Essentially, it looks like we will have the tightest season in a long time. The Worlds should be more interesting than ever. The drum corps placings will likely be the focus of much of the discussion. Inveraray's drummers have been placed 2,2,1 in the first three Majors. Field Marshal, in contrast, have been 3,1,5. It looks likely that the two bands will be splitting the first and second spots in piping between them in both the MSR and Medley sections of the Worlds. If the cards fall absolutely evenly, then this would place them each with 6 points from piping (1,2,1,2) in the final. The ensemble judges are again likely to split the spoils but even if one band secures first spot in both disciplines, that would only give them a two point advantage (ie (2+2)-(1+1)=2). And so it comes down to the drummers. Across the first three contests, the total drum corps score for IDPB has been 5. The equivalent figure for FM has been 9. In other words, the average score for IDPB has been 1.67 and for FM it has been 3. Repeated across the required two performances at the Worlds, that gives Inveraray a 2.67 advantage. Since fractions of points aren't awarded and factoring the possible ensemble differential back in, it's clearly much too close to call. It's often said in pipe band circles that a band has to win the Worlds the year before it is awarded the prize. For Inveraray, the last two years have been characterised by medleys which captured the public imagination. The Hector the Hero medley practically had Bob Worrall in tears in his commentary and the follow up with the Ceilidh Lines/She Moved through the Fair was similarly applauded. It has seemed that Field Marshal's admiring comments have been more limited to "Technically brilliant" rather than "innovative and energetic". In my view, that is probably unfair - but the FM tune choices have perhaps been less inspirational than they appeared 5 or more years ago. Maybe that has changed this year with the "Hard Drive" medley, which certainly set feet tapping the tuning park at the United Kingdom Championships. Anyhow, back to the drummers. The FM win in Belfast feels like the outlier. In the increased field at the World Championships, third would be an exceptional result for them. Fifth wouldn't be bad at all. Most observers would likely see IDPB being no lower than second in either MSR or medley, even with the Canadians (who seem slightly off the pace now) entering the fray. If that is right, then Inveraray could be lifting the spike come August. Perhaps the most unpredictable factors are the other bands. Scottish Power, Fife, SLOT and even Boghall can mix it (a little) with the big boys and even the Vale (or at least their drummers) are making a bid for the top of the pile again. This gives judges the option of favouring their preferred band by slipping a few of the second tier outfits in between the two front runners. In other words, hand the top spot to one of the big two, follow that with, for example, Fife and SLOT and then the other of the favourites. After all, the couple of extra points to the Band ahead would likely be enough to hand them the victory. This seems more likely at the back end of the Bands. It would likely produce howls of derision should there be significant disparities in the piping scores (unless one band has a clearly disastrous run). It is mid-July as I type this. The next Major (and the last one before the Worlds) is the Scottish Championships in Dumbarton on 29 July. I would wager that if Inveraray can collect first place (and particularly should they pick up the drumming award) then they are in pole position for the World title. If a winner emerges from left field, with Inveraray third or below (and no drumming prize) then I doubt this will be their year. Should Field Marshal win and be no lower than third in drumming, then it could well be another title for Richard Parkes come August. 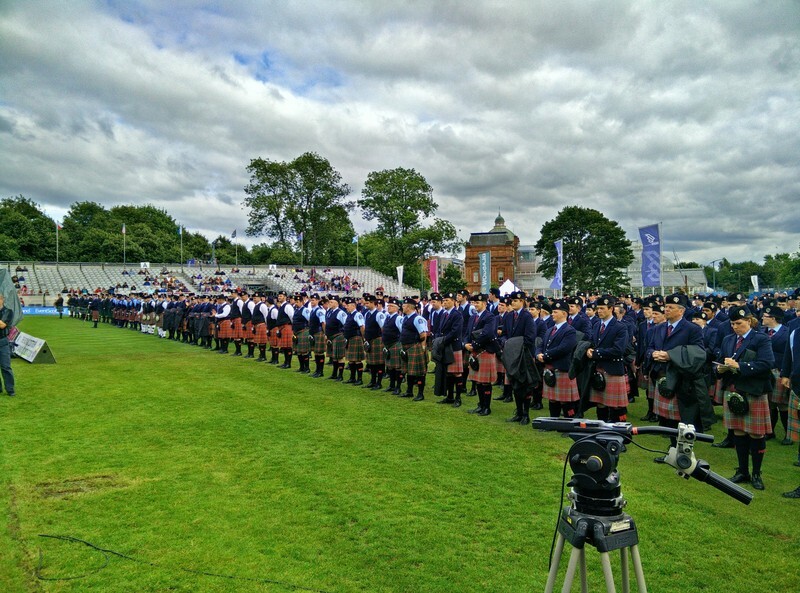 For all sorts of reasons, I have taken my time to think back over the World Pipe Band Championships 2016 before posting my traditional round up blog. The main explanation was that this was the first year in a long time when I was attending in Glasgow as a player, rather than simply an observer. There is no doubt that this casts the whole event in a different light. One significant difference is the response to the Finale. Over past years, I have most often located an abandoned seating area at one of the other arenas from which to listen to the announcements of the prize winners. This year I was standing in the queue to enter the arena for an age, dandering past the podium and then loitering in the centre of the Green, occasionally waving randomly at the cameras to see if we could appear on the big screen (which we did - a lot). It broke up the boredom a little. Just a little. For a bandsman, the finale is not enjoyable - and that's despite the fact that we collected a prize, thanks for asking. For the average spectator, it is interminable. This year it seemed to drag even worse than usual. The whole thing ran on until the light was going, leading to calls for floodlights to be installed before next year's event! This can't go on. Bandsmen and spectators spend the guts of (at least) two days on their feet and frankly, once the finale comes round, just want to sit down. A couple of hours of hanging about in the gloom isn't exactly a fitting end to the showpiece of the competition year. Of course, the problem is easy to identify - the solution less so. It is a well known fact that a sizeable proportion of the competing crowd hits the bar after playing. This may well make them less easy to marshal. I suspect that the notion (which I have read elsewhere) of attempting to corral them into groups of massed bands and then cattle-prodding those groups into the arena simply wouldn't work. In the knowledge that their own band's poor attendance wouldn't be immediately apparent, squads of players would simply stay in the bar! "Give me a call when our Grade is being called, so I can listen in". You know it would happen. You might even do it yourself! Maybe the thing to do is to simply nominate about twenty to thirty bands to take part in the formal march past and let other players join in the massed band if they want to. Left to their own devices, a decent proportion of players would likely amble down towards the front as the prizes were about to be announced. If any band particularly wants to be a part of the march past, they would not be stopped. In truth I haven't even been bothered to check, but I'm pretty sure that every year at about this time I post something on here to say "here we go again" or some such. I post it because it's true. I post it repeatedly because it is repeatedly true. 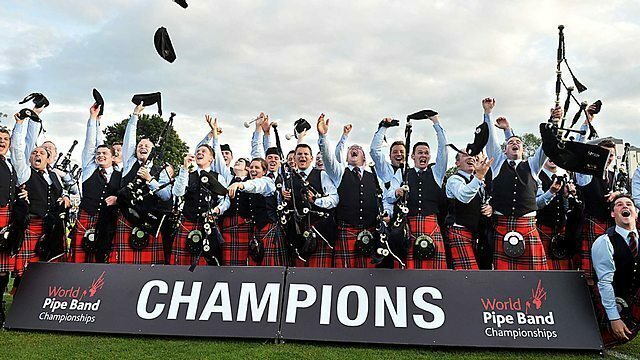 Worlds Week - or Piping Live, as we should now call it - is pretty much the same thing year on year. The favourites may change from time to time. The price of the Glasgow hotels climbs inexorably, and without justification. The weather may be good, or more likely bad, but at the heels of the hunt, it's the same old thing every time. Not that this is necessarily a bad thing. Piping Live has hit upon a winning formula. The town seems at least as busy as ever and although the George Square site seems to have diminished slightly in size, the crowds are healthy there throughout the day. The inclement weather is a problem this year - pipes and drums are notoriously easily upset by the damp and a few of the bands have balked at carrying out engagements in the murk. New Zealand Police caused a bit of a scrum at the George Square location by shunning the piazza for the dry of the tent. It didn't seem clear that they had permission or agreement to do so but the move was entirely sensible with only a couple of days before their qualifying heat. I missed them at Moira but was front and centre for the tented recital and can report they are greatly improved on last year and much more worthy of their Grade One status - whether they will make the final is, of course, and entirely different question. I have also been greatly impressed by their antipodean cousins in Manawatu Scottish. Musical and showing plenty of drive, they may fall victim to the big guns in Grade One - but I would love them to have the chance to show off both of their medleys - they are well worth a listen. I captured their full practice at the National Piping Centre yesterday and got more of them today at the Todd, so there will at least be a video record of this top notch outfit. I'm not sure that I have either the energy or the inclination to ponder the Grade One results. Go back and read the blog from last year when I predicted what would befall Field Marshal Montgomery almost precisely. They still have the same issues. The drum corps will be well down the final reckoning, whereas the pipers still stand above any other band. The additional problem this year is that Inveraray & District has been catching up and if they can garner three or four "2"s across the performances from the piping judges together with, say, a 1 and a 2 in ensemble, they should comfortably lift the crown. It's hard to see their drum corps slipping lower than second or third - if judged fairly. All we can do is listen intently and then dissect the results forensically when they emerge. With my own Band coming to Glasgow for the first time in many years my video efforts on Saturday will be truncated in favour of playing, but that will hopefully pay off at some point later in the day, after the 300 hour long finale. In the meantime, my incredibly slow hotel internet connection has foiled my plan to upload as I go, so I'll have to start firing clips up once I get home. Whether there is much, even from Friday, will again depend on whether the RSPBA decides to enforce the ban on video - shame on them if they do. I will look forward to watching stewards or security men wrestling mobile phones from the hands of infants who are "Facebook Live-ing" with their mates at home. I'll wait and see what happens in that regard but would be surprised if this doesn't raise again the issue of who owns the performances of the top bands. Many will recall the discussions that used to abound over the fact that the Worlds CDs (remember those?) used to make a tidy profit for the Association but not one penny for the performing artists. Surely the same issues surround the broadcast rights? No bands, no contest, no money. Share the wealth, guys! The trudge back to the airport. The sterile check in area. Security. Any liquids, sir? Spotting the faces of yesterday's competitors, either deflated or elated, as they manhandle drums cases and pipe boxes off coaches. This time I also rather enjoyed the spectacle of the be-turban-ed Malaysian Sikh band queued to check in. Piping Live continues to be a glorious festival of all that is great about piping and drumming. The ache in my feet would suggest that the various venues across Glasgow may be spread too far apart. Although I always end up spending a lot of enjoyable time at the National Piping Centre, the venue is much too cramped. I wonder whether, given the enormous expanse of Glasgow Green, a tented village could be created there to serve as a hub through the week. The George Square performance area would need to be preserved and "Bands on Buchanan Street" has proved a successful initiative, but the relocation of events currently staged at the Piping Centre and the College of Piping to marquees on the Green would allow for a true "festival" atmosphere to develop. Although I have written before that I find it almost inconceivable that the Worlds will venture outside Glasgow again, the "tented village" concept would almost certainly have to be employed if it did. My highlight of the week was attendance at the Inveraray practices at the Todd. It was a privilege to watch them work. A particular high point was the chanter practice behind the bar. The harmonies in the Hector the Hero Medley are somehow even more haunting when played more quietly and without drones. Spellbinding. The Two Day Worlds looks set to stay. Two days of almost entirely dry weather brought crowds back to the Green - although Day One is still quite poorly attended. Inflated prices from food vendors and the usual Finale That Wouldn't Die™ remain bugbears but at least the finale is more tolerable when you aren't getting rained on. The new feature for this year was the removal of an adequate public address system. They seemed to be using one of those speakers you can plug into your mobile phone to annoy passersby. Either that or the entire crowd had gone suddenly and simultaneously deaf. Well done, RSPBA. Nobody saw that coming. And if they did, they certainly didn't hear it coming. On the playing front, we have likely witnessed the end of an era. This season has seen quite a number of bands get up into the heady atmosphere previously occupied alone by Field Marshal. I doubt, however, that this will now be an era of dominance by Shotts - or indeed any band. I think what we will see now is the Majors being shared out between four or five outfits over the year. The Jubilee trophy could well find itself jumping from one trophy cabinet to another year on year. However, playing against the Kilpatrick, McWhirter or Creighton outfits will always lead to unfavourable comparisons. We are certainly spoiled for great back lines - and it will become harder and harder to separate them as well. The styles of playing of each of the leading drummers are reflected in their corps and it appears to me that any observer will tend to select their champion based on the type of drumming they prefer, rather than an objective standard of near perfection. If there was one band on the day that I could have listened to all day, it was Inveraray. Even though I had heard them on two other occasions over the week, I kept being drawn back for a little more. If there was a judge tasked with ruling on Medley composition they would have been in a class of their own. One annoyance on the day was the constant supply of drivel via social media. The advent of the live stream has been a superb innovation, but it is no substitute for being there. And even being there isn't all it is cracked up to be. Whether huddled around the arena, or even in the sparsely occupied stand, you are a long way back from the bands. It was a windy day and with each gust, sound was either blown towards the listener of whisked away. The limitations of broadcast technology and home speakers will always result in imperfect transmission. To be the judge, you need to BE the judge. By way of example, when listening to Shotts walk in to the MSR, I could have sworn they had an issue with their rolls, but I now put it down to the wind affecting what I could hear. Yet still, after each band played, we were treated to "*insert name of band here* won it out of the park". To my mind, the only sensible approach was to accept that the contest was incredibly close, quietly pick your own favourite, hope the judging would be fair and await the result. So, was the judging fair? Hard to say. As usual, I spent most of my time in the tuning park. As a result, my opinions were based more on what bands were going well rather than the crucial performance in the arena. I could have accepted victories from any of about five bands as being within what was possible. Shotts was one of those outfits. The only disquiet I feel is about the FM drumming scores. I accept that they could be fair enough, but I can't help feeling that 7 & 8 happens to be about as low as a judge could get away with putting them. The drummers who beat them could potentially have done so. The ones below couldn't. That has a slight whiff of set-up. You know? The sort of "it's not your year, fellas" thing that people chat about in beer tents. That makes me a little uncomfortable. Having said that, look at the bands that beat them. Shotts, SLOT, Inveraray. Reasonable enough that each of those bands would deserve a top three spot? Absolutely. Fair enough then. Squinting at the Master sheets night wasn't a desperately scientific exercise, but I'm happy enough that the top six were all good value for it. It might be a little revealing that there isn't anything like the same chat about the judging this morning as there was at this time last August. Although that may be due to the post Worlds collective hangover. I'd give it a day or two. My flight has been delayed but there's only so long that a person can nurse a cup of tea in Glasgow airport before café staff start to grumble, so I'll wrap it up there and make for the gate. Same time next year then? ]]> Admin tag:aiblins.com,2013:Post/894098 2015-08-15T22:47:17Z 2018-02-22T11:27:05Z Day Two. Any the Wiser? Another World Championships over and another set of winners and losers. Well done to all the bands who survived the ordeal and special congratulations to the prize winners. Naturally, the greater number of oohs and aahs was reserved for the Grade One decider. Standing close to a bunch of boisterous SLOT fans was an interesting experience. Once they had been called as lifting all the drumming gongs, their supporters had already started to fill in their programmes with SLOT getting the spike - only to have their hopes dashed as Shotts got the nod. Although this blog records that I had predicted the possibility of FM sliding much further than second, it still seemed surreal to see such a gifted outfit relegated to fourth. It was less than edifying to hear so little applause when the band was called. They may be the band that everyone wants to beat, but competitors should note that grace is required in victory as well as defeat. With a total of 15 from drumming across the two final performances the former champions faced an impossible task. Take a look at the Qualifiers though. First and fourth in drumming in their section. Having listened to their MSR performance in the Qualifier those scores were well deserved. Is there a danger that certain judges are now simply convinced that FM's drummers are sub-par? No matter how they actually play? No one "won it out of the park". Grade One has not been this competitive in my memory. I absolutely adore the Inveraray Hector the Hero Medley. Given my choice, I would have given them the title just for the genius of the construction of the harmonies in the air and the glory of the reprise to finish. It was great to see them right up at the top after a season where they appeared to have fallen out of favour for whatever reason. The sheer talent in that band will see them lift the ultimate prize sooner rather than later. SLOT is a better band now than when it won the World title, but it needs to be. Things have moved on and they are progressing nicely. The drum corps is lauded for its dynamic range, which is surely the best in the Grade. However, for me, the playing in Inveraray almost matches them for light and shade but bests them in musical expression and technique. Greater Glasgow Police also impressed me, but I think their sets in the Qualifiers actually suited the corps better with some really subtle playing. In terms of sound and technique, I think FM is still the clear class of the field for piping. Drumming is where the contest is tighter. In truth, any one of about five outfits could have received the drumming prize and little could have been said about it. Of course, this is why we need to be confident that judges are trying to separate the various squads based on some objective standard, rather than just playing favourites, or trying to knock others out. Let their conscience be their guide. In other matters, the second day was graced by fine weather with only a couple of brief showers. Very pleasant. The prices of tea and coffee were generally extortionate - aside from Dinky Donuts & Rachel's who admirably stuck to their £1 a cup and should be lauded for it. The finale was abysmally long. PLEASE sort it out. The Association had clearly skimped on the PA which meant the results appeared to be being whispered by a man troubled with laryngitis. ]]> Admin tag:aiblins.com,2013:Post/893768 2015-08-14T21:14:05Z 2018-02-22T11:27:05Z Day One. Done. That's one day done and one to go. The World Championships of 2015 kicked off under grey skies in Glasgow with the threat of showers to spoil the party. Thankfully, they never materialized and conditions were largely identical for the succession of Grade One outfits vying for a spot in tomorrow's final. It's well known that Grade One now splits clearly into the Premier League and the First Division. For the premiership bands (FM Montgomery, Inveraray, Shotts et al) the risk today was only of a slip up - and there wasn't one. As a result, the usual suspects all eased through. For the rest, qualification would be a result in itself. This year's likely also rans in the final will be the Halifax Citadel variant of the 78th Frasers and Canterbury Caledonian. Well done to both. However, looking at the calibre of bands they will face, it seems likely they will both be striving not to be last in the final. I don't think that I spoke to a single soul in the park who had their mind changed by what they heard on the day. Smart money still seems split between FM, Shotts, Inveraray and SLOT. All seem to be going well, but FM in particular sounded sublime today - and the drummers were sharp and sympathetic to the magnificent pipe corps. The crowd seemed slightly improved on last year's day one, but the hour and a half it took to sort out the results of only 22 bands did seem a little ridiculous. The musical preamble of Worlds Week is drawing to a close and the business end of the operation is on the horizon. One more sleep until the World Championships starts with the Grade One Qualifier. Clearly, that won't be in place for tomorrow, so we plough ahead with what we have. And what have we learnt over the last few days about who might end up on top? Too close to call is probably the most apt of the truisms currently circulating. FM Montgomery have a pipe corps with enviable musical chops but Ryan Canning has Shotts humming and Alen Tully has lifted his first Major this season with SLOT. SFU is a band riding high after their very well received concert and Inveraray is still the favourite of many a punter. 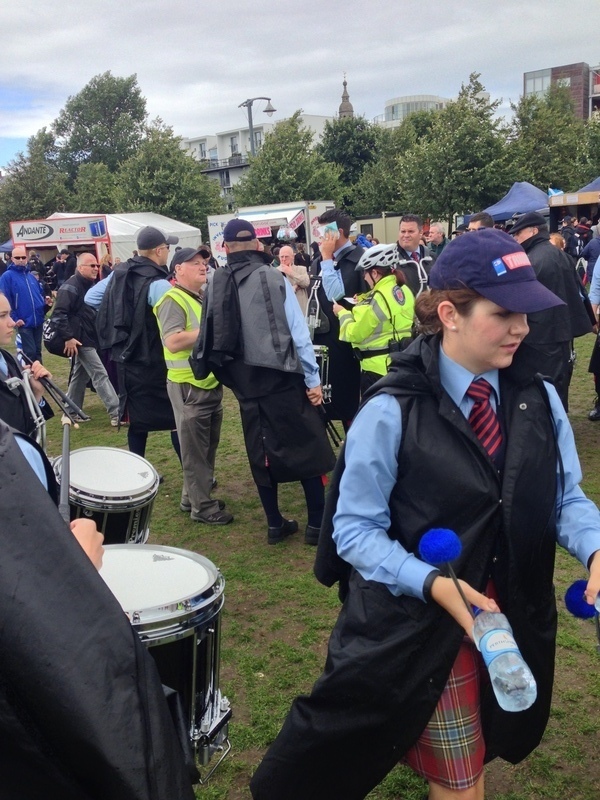 Although most of the aficionados in Glasgow have their own theories, one common thread is that only the drumming can sort out the final result. You can read my last post to see what my view is on the arithmetic, but there is no doubt that the drummers will be center stage like seldom before. The FM corps has been slated on social media - but often by those who choose to ignore the track record of Keith Orr's charges at the Worlds - they can certainly play with (most) of the big boys. Don't rule them out for strong performances when it matters. My predictions? It will be a belter. I wouldn't want to have to pick an outright winner but having heard both Shotts and Inveraray at length over the last couple of days, either outfit could be winners. I'll never rule FM out completely, but they'll need to be at their imperious best to lift the silver chanter. As for the Qualifiers, I think there will be at least one upset. The first group is full of big names and I have an inkling that Triumph Street could struggle - even though they are going fairly well. The real issue is that standards have become so high amongst the top flight that even great bands constantly need to bring their A game. If you close your eyes and clear your mind you can even smell it. The unmistakable odour of damp kilt that tends to accompany the World Pipe Band Championships every year. We are a week away from the start of Piping Live and in just two short weeks the whole shebang will be receding into the distance once again. More and more the World Championships form only a small part of the spectacle of Piping Live (or the event previously known as "Worlds Week"). Personally, I experienced a tangible excitement when a copy of this year's programme was thrust into my hand. 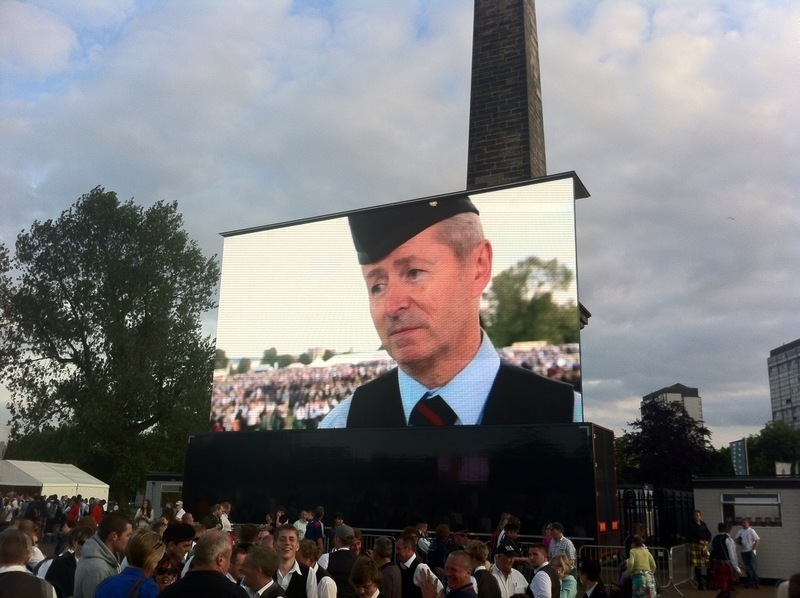 Roddy McLeod should be cheered from the rooftops for turning the ad hoc events into a structured festival of piping and drumming which has become the highlight of the worldwide piping scene. 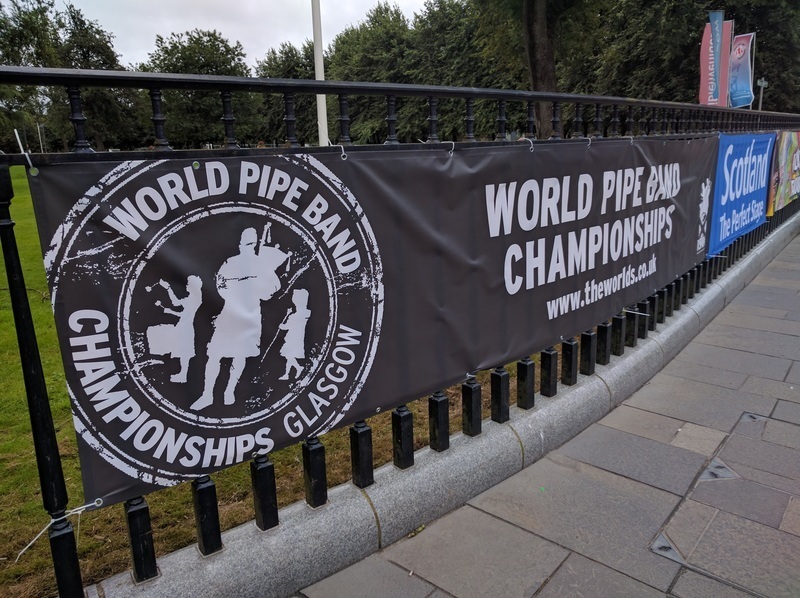 Of course, one of the side-effects of the success of Piping Live is that it has effectively secured the World Pipe Band Championships at their Glasgow venue in perpetuity. Several years ago I had a slight involvement in the project whereby Belfast submitted a bid to stage the Worlds. At the time it has seemed like a reasonable enough notion and the City Council certainly ensured that the appropriate shoulders were applied to the relevant wheels. However for various reasons (some perhaps questionable at the time) the bid was not successful and I have no doubt that this turned out to be a good thing. Since that time, the Piping Live programme has expanded in a way that nowhere outside Glasgow could match. 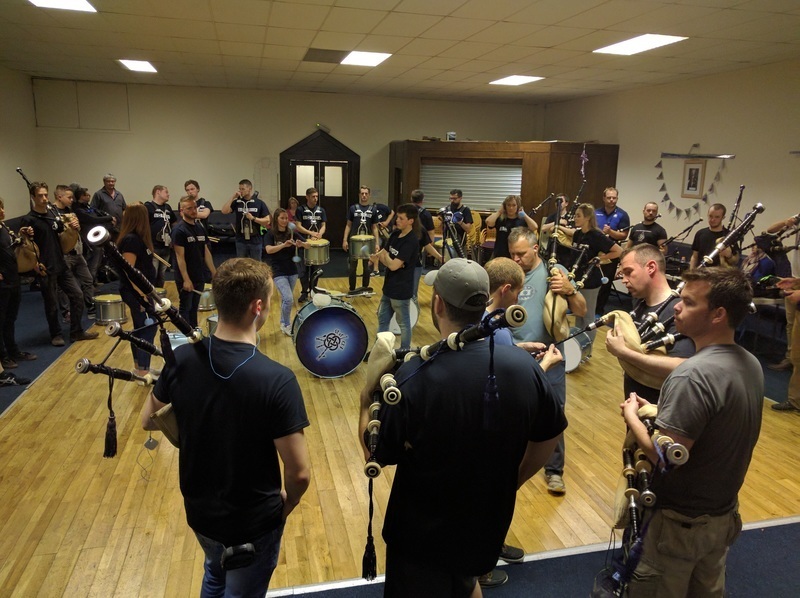 The range of venues, including the National Piping Centre and College of Piping and the sheer concentration of major piping and drumming figures nearby means that other locations really can't compete. So, secure in the notion that I will be shovelling money into the gouging pockets of Glasgow's tourist industry for many years to come, what of this year's competition? Well, things should be a lot more interesting this year than they have been for some time. In the past handful of years the Grade One title as been loosely in the grasp of Field Marshal Montgomery. Richard Parkes' fingers have not been so tightly around the trophy as to make it a foregone conclusion but the title has been more than likely to return to Northern Ireland year on year. Although FM Montgomery is still the band to beat, recent results have shown that it is certainly possible to do so. The three way tie at the Forres and the SLOT victory in Dumbarton have thoroughly pierced the shroud of nigh on invincibility which had surrounded the NI front runners for a while. More than that, a few bands which have been operating slightly below for a couple of years have rebuilt and come back stronger than ever. Shotts anyone? The North American scene seems to be warming up again and the UK contingent will likely be watching performances from SFU, Triumph Street, the 78th Fraser Highlanders and even the Halifax Citadel with more interest than they have had for quite some time. Scottish Power seem to be on road back again - and bear in mind that they placed 2nd only two years ago. A few experiments with numbers in the pipe corps didn't go well at all but the change of leading drummer looks to have been a success and anyone who rules out a musician of the calibre of Chris Armstrong is a fool. Frankly, the field is wide open. Looking at the current title-holders, it seems that the weakness in the band is at the back end. 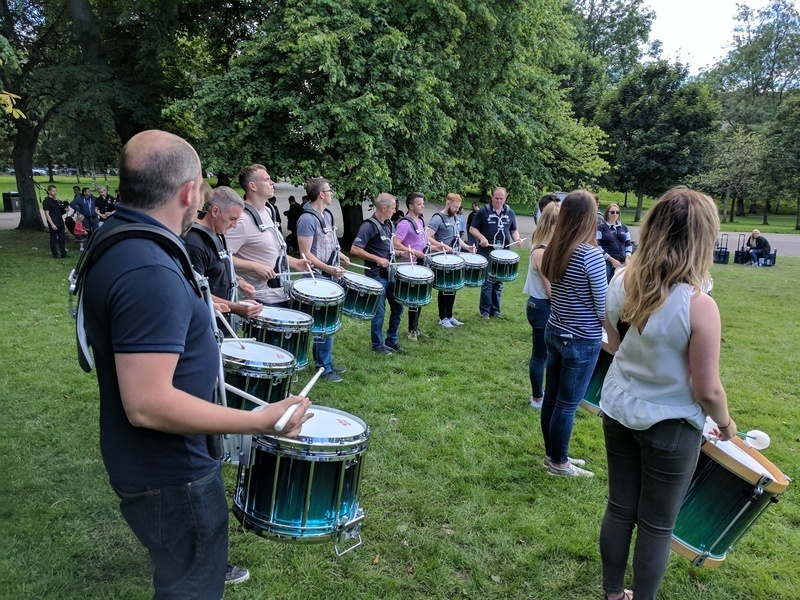 The drum corps sits someway behind the pipers in the standings and the 8th place for Keith Orr's charges in Dumbarton ultimately made the difference. If they lie as far back in the Worlds they need to rely on other pipe corps having really bad days to allow them to slip in. For example, imagine that FM achieve 1,2,,1 across the piping and ensemble judges in each of the MSR and medley runs. However, place them mid-table in the drumming - say 5 and 7 - and you have a total of 20 for the final. Next, pick your likely contender band of choice - let's say Shotts for the sake of argument. It is entirely possible for them to take 1,2,3 in the piping and ensemble combined with 1,2 in the drumming - a total of 15. Say hello to the new World Champions. 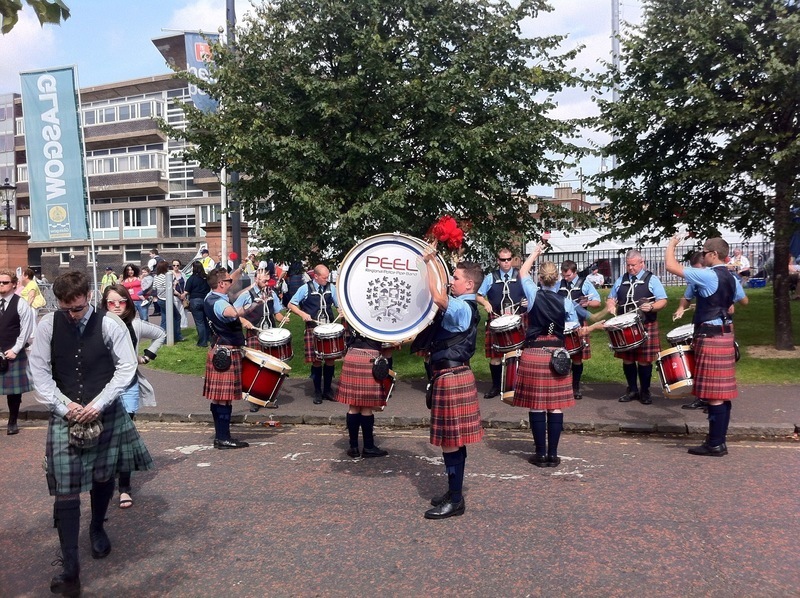 The other bands likely to place well in the drumming have now lifted their pipers to such an extent that they can nip at the Ulstermens' heels. The drumming will make the difference. All in all, it makes for what could well be the most hotly contested Grade One contest in years. The day after the Worlds can often seem a little flat. So much piping and drumming takes place in the Worlds Week - now rebranded as Piping Live - that the cold turkey on Sunday can be hard to stomach. Funnily enough, in my experience, the two day championships have largely put paid to that feeling. I'm not saying that I'm sick of it all - I just feel like I have had my fill. Walking through Glasgow this morning, the husks of bandsmen clambering onto buses would seem to agree. It is maybe too early yet for a proper post mortem on the results. Facebook is awash with the usual fan boys shouting loudly that their favourites were harshly dealt with. The more considered analysis is someway off. I did see one post mentioning the family tie in the medley judging. A Field Marshal loyalist quickly replied that they could have been 5th in the drums and still won. Whether that maths is technically correct or not, it fails to appreciate that the issue is less the placing than the gap between any given band and its closest competitors. Anyone listening to FM this past year would find it hard to place the drummers in second place in any contest. Look lower in the results - at the bands with pipe corps capable of approaching the Parkes gold standard - and where do we find their drummers in the medley? Well out of it. Inveraray 6th? Power 5th? Boghall's pipers have slipped a fraction, so it was safe enough to have them 1st. Shotts are not yet the complete package, so 4th was okay. SLOT in third was probably the biggest risk to FM overall, but that powerful corps would look ridiculous much lower. Granted, FM played their more comfortable medley in the final, but the high drumming place will raise a few eyebrows. Either that, it the low position of 7 for the drummers in the MSR will do likewise. Indeed, looking across the FM drumming performances for qualifying and final it reads 3,2,7,2. The seven is the outlier. The reason that the medley will draw attention is the family connection. When considering bias, it is well known that the appearance of bias can be corrosive, even if no actual bias exists. Most bandsmen will know that certain judges are felt to favour certain outfits. It is probably inevitable that they will do - prejudices about playing style or tune selection will always out. When a judge at the top level level happens to be the brother of one of the key competitors the eyebrows will start well raised - before a note is played. Whether it had any impact on the results, it shouldn't be allowed to happen again. Away from the playing, my personal jury remains out on the two day experiment. I wouldn't applaud the Association for partially fixing a problem which they created themselves last year. Akin to the man seeking praise for stopping beating his wife - they shouldn't have done it in the first place. "Better than last year" - that's my damning with faint praise. The solution? Deal with the Grade 2 bands wrongly placed in Grade 1. Split Grade 2. Shorten the finale. Speed up the results. Simple. Another day older and another Worlds safely out of the way. Aside from the residual tiredness caused by Friday's tramping about the Green, today felt much more like a "traditional" championships. 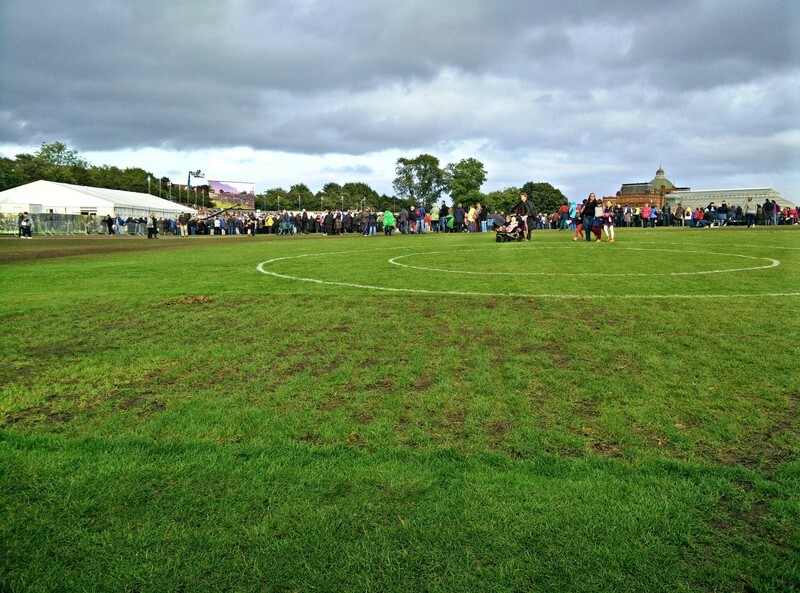 Almost all competing bands were kilted up and in attendance, apart from the occasional forlorn figure of a grade one non-qualifier who would drift, purposeless, around the field. The day was dominated by the weather. In truth, it was reminiscent of the day one washout last year. Capes and other waterproofs were the order of the day, despite the sun peeping out once or twice. A couple of bands suffered through downpours whilst performing but I heard no one suggest that results would be compromised. Grade One seemed to buzz past at quite a clip. With only 12 bands in the final, the contest was perhaps a little brief. Another couple of competitors would have done no harm but would likely have only filled the ranks of the also-rans. The brevity of the grade allowed the Grade 2 bands to take over the main arena for their final. Although this was quite the coup for those playing in the second tier, it seemed somehow wrong to have the premier event over before grade two got properly underway. It might be better to consider slipping the Grade 2 final in between the MSR and Medley performances of the big bands - if the Association wants to keep them in the Arena 1. The crowds were much better everywhere - except in the stand around Grade 1. Maybe it was the weather, or maybe the pricing needs looked at - but the stand was certainly sparsely populated. The second year of the two day experiment was undoubtedly an improvement on the first but it illustrated quite clearly that the need for the second day is only in relation to Grade 1. The more radical solution (and the more logical one) would be to relegate the bottom 25% of Grade 1 into Grade 2 and then split the lower grade into an A and B. I have yet to hear a convincing counter argument. I can understand that the Association wants a sizeable premier grade, spread worldwide, but the gulf within Grade 1 is now so pronounced that this is no longer viable. I'll not hold my breath. Despite the best endeavours of the weather, the contest has run to conclusion and the results are in. Now is the time for recriminations. After the undoubtedly poor reaction to the 2013 two day experiment, the RSPBA had a rethink for this year and came up with another 2 day plan- but this time substituting the Sunday for a Friday. Not exactly an Earth shattering change, but one welcomed by most critics. Attendees can still make it home for work on Monday morning and the format of the Saturday remains recognizably that of the "traditional" Worlds. 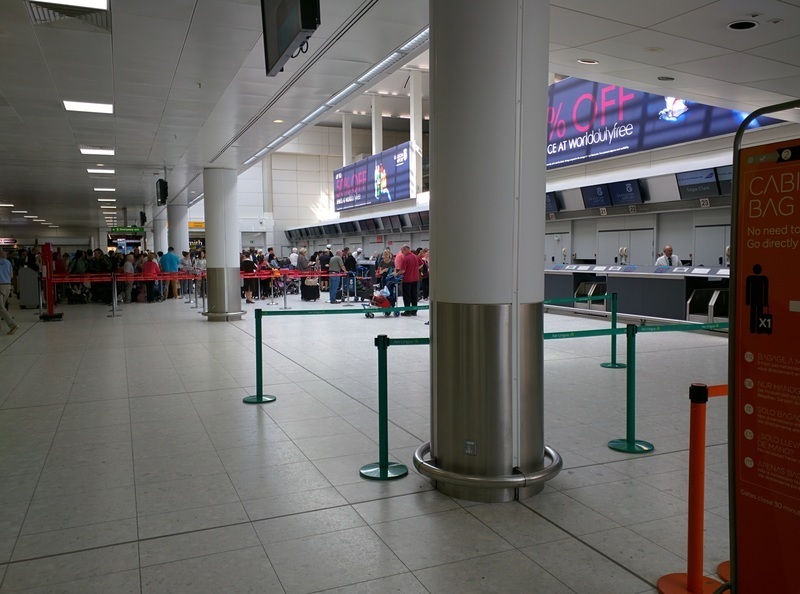 It's hard to say whether the move to a Friday start has had much of an effect on travel plans, but my initial observation, having been here since Wednesday, is that there was a peculiar lack of Grade One bands in the usual practice haunts. The Lord Todd bar at the university is normally heaving with big bands from the middle of the week but they were strangely absent this year. Most seemed to have opted to stay out of central Glasgow - and the Scottish outfits appear to have decided not to bother coming to town until Friday itself. It's hard to know whether this is due to the format change, a change in strategy, or a reaction to the continued price gouging by Glasgow hoteliers, but it made for a rather quiet town. Of course Kelvingrove still seemed busy and the parade of bands up and down Buchanan Street livened the place up, but it will be interesting to see if the pattern persists next year. Piping Live looks to be in rude health, but not without issues. 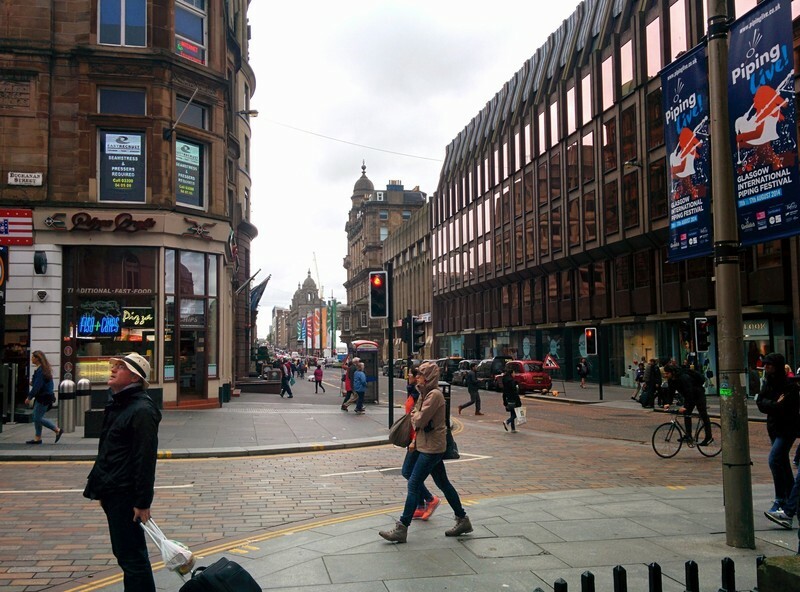 With a giant Commonwealth tent occupying George Square, the festival lacks a city center hub. The tarmac carpark at Candleriggs really doesn't hit the spot and relegates the event to the status of a car boot sale. The National Piping Centre remains a good meeting point but the site isn't big enough - even with the addition of the tents out front. The obvious answer is a return to George Square for the hub, but perhaps the event at the Piping Centre (save those in the auditorium) need to move there too. The outdoor practices for Triumph Street and Lomond & Clyde were impressive but playing spread across steps at different levels is fairly silly. So, what of the Worlds itself - thus far? Well, the crowds were pretty dismal. In anticipation of this, the RSPBA only opened half the site. Consequently there was little choice of food and almost no trade stands or other distractions. Splitting the grade into two simultaneous heats may be the only solution for a Grade One of this size, but it leads to talk headaches if you want to see bands in both heats. I was told a story of a man who complained that he had bought a grandstand seat and was horrified to learn this only entitled him to see half of the bands. The qualifiers were perhaps largely predictable. The 78th will be pleased to have had something of a return to former glory - and they were playing with more drive than I have seen in several years. Triumph Street have a confidence in their presentation that could well be rewarded with a top six spot - I certainly expect them to be the pick of the Canadians. SFU is a band which seems to have lost momentum and their playing today seemed somehow lacklustre. Day Two done and it's all over for another year. Well, I was clearly pretty skeptical after Day One, but I set out to the Green with determination to keep an open mind. A spectacular Sunday would perhaps consign the Saturday reservations to the scrap heap. As I approached the park, one thing which puzzled me was the way I was feeling. Usually, on the day after the Worlds, I am itching for more. More pipes, more drums, more haggis, neaps and tatties. But not today. I wasn't sure what I was feeling, but it wasn't the normal anticipation the Worlds provides. It could have beeb the weather from yesterday; it might have been pure tiredness; but whatever it was, it was a feeling I wasn't accustomed to. I got to the Green as the Grade One MSR contest was about to begin. 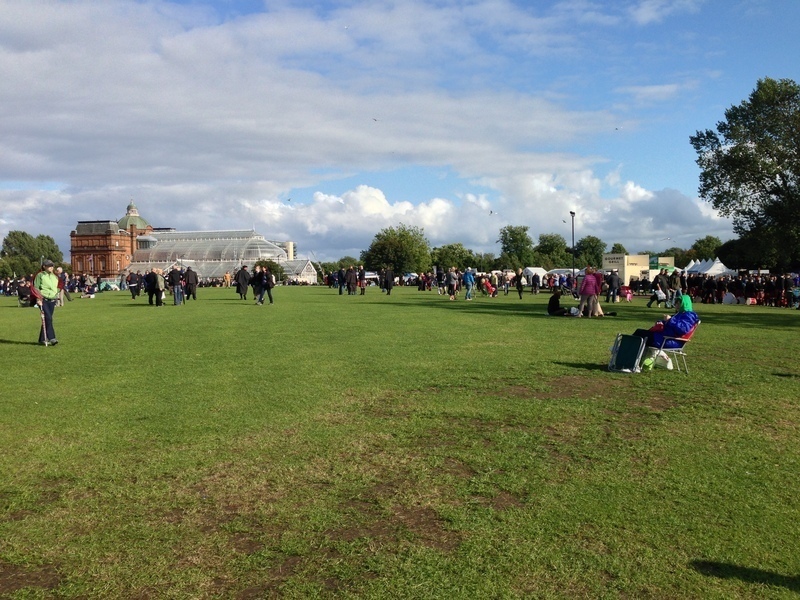 In contrast to Saturday, the skies were blue and the big bands were strutting their stuff. I raced round the tuning park, videoing all manner of warm up routines. Again, the crowd levels were immediately noticeable. Normally, the art of the tuning park videographer requires a great deal of guile. One must try to anticipate the next move of any given Pipe Major, one must acquire a skill of predicting when a "take five minutes guys" break will conclude and the drums will be slung back on. The alternative is to find yourself at the back of a 10-deep mob, struggling to get any shot at all. Not so this year. The more prolific winners were still attracting decent numbers but it was nonetheless possible to saunter up to even Field Marshal and SFU without having to elbow any other spectators in the ribs. And that was before the rain came. Saturday was a worse day consistently but Sunday was vicious. High winds meant that torrential downpours were arriving unpredictably but with ferocity. Some bands lucked it and avoided the worst but others had incredibly fragmented tuning - running for cover and darting out when a patch of blue sky appeared. The performances probably suffered for some bands and then was at least one literal casualty. 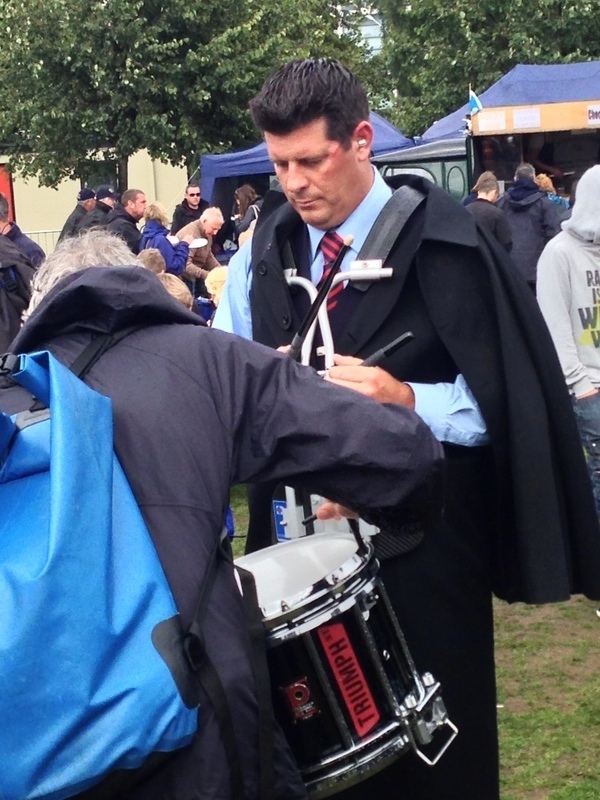 A drummer from Triumph Street failed to dodge a flying sign which had blown off a food stall. For the rest of the day he sported a nasty looking gash to the side of his left eye. I also saw an RSPBA sign hit the deck - but a few metres from any spectators. After the MSR competition was concluded, I took advantage of the lull and made for the food stalls. Again, they were quiet - not as bad as Saturday, but quiet. Indeed, the whole park was pretty quiet. With half the competition done the day before and many bands already heading home. It was possible for the whole place to descend into silence. That's not a feature of the one day event. Returning for the Medley performances, it was more of the same. If anything, the showers were more frequent, but perhaps lighter. This didn't help with the tuning, as neurotic Pipe Majors headed for the tents at the first spit - fearing another deluge. As is my wont, I spent my day in the tuning park and skipped the ring. It is hard to hear from distance and frankly is probably better observed from the comfort of a sofa on the live stream. It is no real predictor of performance in the ring, but I liked Greater Glasgow Police, Triumph Street and Boghall. The Boggies seemed to have very little collective practice before going on and Ryan Canning appears to have adopted the Patented Parkes Preparation Method - keep tuning and play in sixty second bursts to keep things going. Speaking of Shotts, the drum corps seems reinvigorated. They are tighter and more musical than I have heard them in years. I'm not sure whether Jim's well-documented troubles last year have energised him, but something seems to be working. The Grade One contest concluded with Triumph Street and there began the wait. The Finale was the usual turgid affair. The intense cold and the threat of further rain led to more grumbles than ever about the length of time it was all taking. The truth is that the spectacle delivered by the Finale is not worth the delay it creates. Thankfully, it was briefer than usual due to the absence of the Saturday contingent of players. The results were the usual mixed bag. Perhaps unusually, the Grade One winners seemed to meet with universal approval. Field Marshal have been so good of late that no one seemed to begrudge them the victory. The drum corps finally captured the World Title - worthy winners too. Interestingly, during the finale, just after Grade One had been called someone left a mic open amongst the officials. It was faint, but there seemed to be a conversation about the crowd level. If I picked it up correctly, they seemed to be commenting on the respectable crowd on this hill but wondering "where they all came from". Certainly, the crowd was better than it had been but it fell far short of the usual Saturday crush on the hill. The reason for the swelling in numbers at the end was, I suspect, due to the bars closing and the traders frantically dismantling their stalls whilst the bands assembled. I spoke to a few traders and didn't get any positive response to the Two Day format. One said she had been busy but emphatically stated she didn't want the two day experiment to be any more than that. Food traders seemed badly hit. I saw several stands where staff far outnumbered customers. Taking into account the pitch prices, I suspect quite a number will have gone home much the poorer for the whole thing. In my conversations with all and sundry, I couldn't find a single soul who liked the new arrangement. 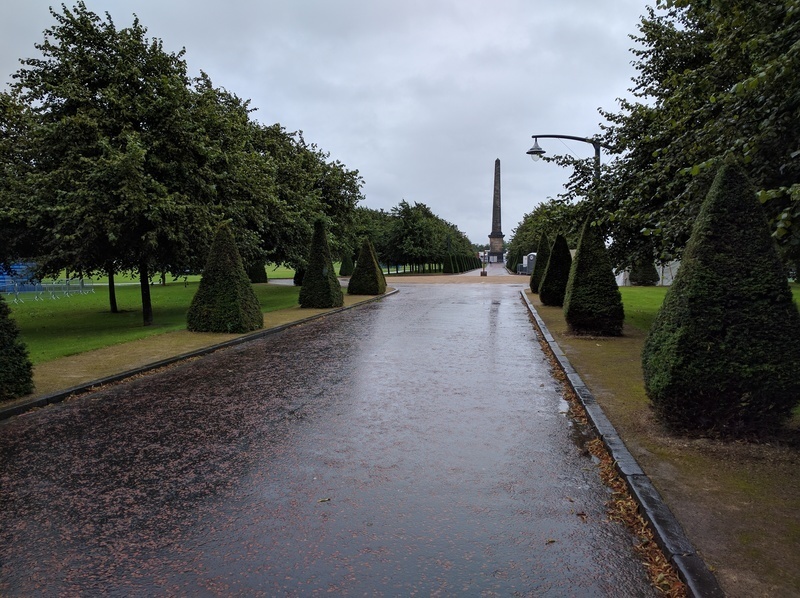 A word which has entered my head as I strode into Glasgow Green in the morning was "flat" - and the same word was independently used by quite a number of others, entirely unprompted. The atmosphere was lacking and that could be for any number of reasons. Bad weather is a risk at any contest and the Worlds has no special immunity. It doesn't usually harm the feel of the place. More likely the stretch in the events and the splitting of the contest diminished the crowd to a degree which wasn't anticipated. I suspect that the Association believed Saturday players would return as spectators on Sunday, but they didn't. They left - and they took family and friends with them. This resulted in a colossal hole in the crowd. During the Finale it was announced that there will be a vote in September to decide the format going forward. It will be interesting to see if anyone speaks in favour of two days, and if so, why. For the sake of balance, I happily identify one positive feature. The chance to hear the non-qualifying Grade One outfits run out MSRs and Medleys on Day One made for a pleasant change. 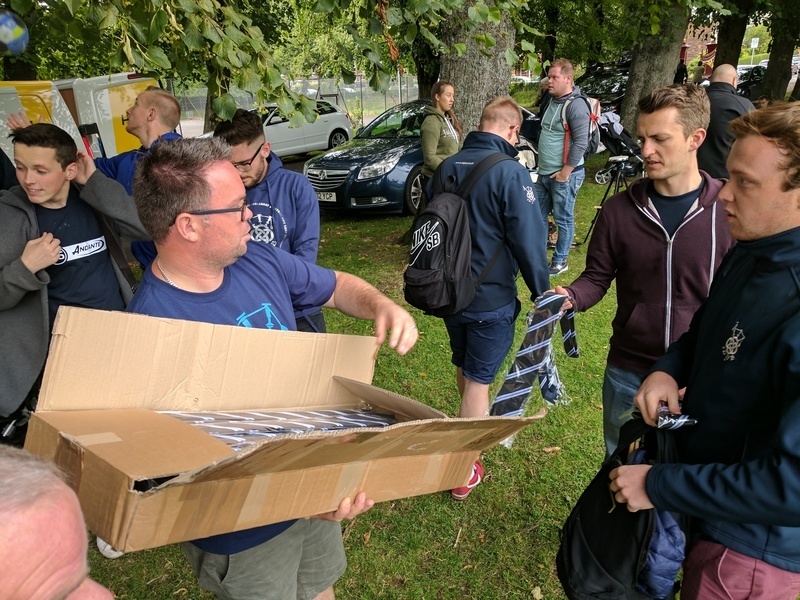 As everyone probably knows, the old system, complete with bands pre-qualifying, resulted in the Bands forced to play for their place early on a Saturday in front of no-one. If unsuccessful, a Grade One band could effectively be done for the day by 9.15am - and never have a chance to air their medley at all. Of course, many of the lower grade bands can still be done after a poor qualifying run early in the morning and the decision to run qualifying and finals for other grades entirely in the space of either the Saturday or Sunday has made no real change to the Worlds experience for many of those bands (save for the fact that some bands now have their Saturday on a Sunday, if you know what I mean). I'll not labour the point, but I still think that the answer is to shift back to the one day format in tandem with a re-grading exercise. The resultant smaller Grade One would allow for a two round "final" featuring around 16 Bands to take place within the space of the single day, eliminating the need for qualifying entirely. It would also return a number of the lesser Grade One outfits to Grade Two, where they might actually trouble the Judges. ]]> Admin tag:aiblins.com,2013:Post/595692 2013-08-18T16:59:36Z 2013-10-08T17:28:43Z Will it Never End? ]]> Admin tag:aiblins.com,2013:Post/595635 2013-08-18T15:28:58Z 2013-10-08T17:28:42Z Hello Grumpy! Going very nicely for one of the outsiders in the final. And sounding pretty hot. Slightly duller drum sound than some?